The EPICS control system is a free and open source control system (https://epics-controls.org). It is used to operate devices such as particle accelerators, telescopes and other large experiments. This page explains how Easy LV|HV makes it simple to control MPOD crates with EPICS. MPOD crates and the included high- and low voltage modules can be controlled by using a software support module. We suggest to use the NSCL EPICS snmp device driver to control MPOD crates with EPICS. Download this driver from https://groups.nscl.msu.edu/controls/. You can find it on the EPICS website → Resources and Support → Modules → Soft Support. Export the db file for EPICS. Start the NSCL EPICS snmp device driver with this db file to control the same MPOD crate with EPICS. specific high voltage power supply modules (iseg EHS, EBS, ESS or EDS). particular features of the used low voltage modules (Wiener MPV). 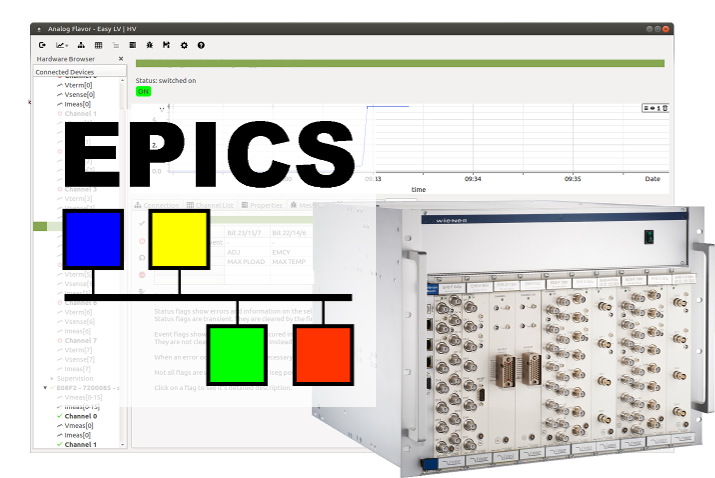 the naming convention and requirements of the EPICS control system. A more generic set of files (several db files and a sub file) can be downloaded from our website or provided on request. We provide support for adjusting and validating db files for particular needs and getting your MPOD crates with EPICS running. We test the db files and the device drivers on our hardware. These tests include simulated hardware. As a consequence the db files allow to handle rare events and trigger alarms in an appropriate way. If you prefer TANGO Controls, this post might help you to set up your MPOD crates with TANGO Controls.